A few months ago I studied a step by step lesson on painting a panda in an Chinese painting book. The eyes, nose, mouth and ears were painted first, and time and time again I ran out of room on the page to fit the body and back legs. I decided to allow the panda to be enormous and go off the page, then paint small birds to add to the sense of scale. That lead me to the thought of a story, that the panda was only a baby, and the birds could some how tell she needed their help. It was a reminder for me to stop and help someone people in need when I encounter them, rather than doing what is easy and flying by. Anna was a happy baby panda who more than anything else loved to sit on branch and chew bamboo stalks, so you can imagine how heartbroken she was when a loud noise startled her and she dropped her snack.She cried as she watched it fall, and a pair of swallows watched it as well. Sally and Cindy swallow glanced at each other, and without hesitation caught the bamboo before it reached the ground and headed towards the panda. The panda was enormous, and with one swipe of her massive paw could crush their small bodies, but they knew what was right to do. They sang a quivering song to calm their nerves. Anna stopped sobbing when she heard the song.When she saw them tremble, she was touched by their kind act. A happy tear rolled her furry face, and she extended her paw to welcome them. 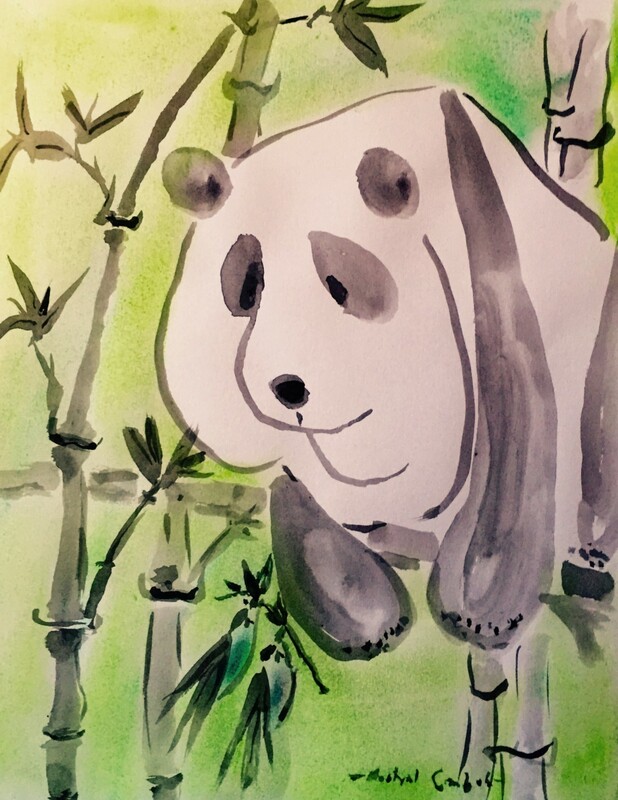 The birds winced when they saw the massive paw head towards them, but when they saw Anna’s gentle eyes they knew they were safe.The panda’s white fur felt soft and warm to the swallows, who gently released the bamboo plant from their beaks. Anna lifted her paw towards her eyes to get a better look at her tiny friends. A warm glow seemed to fill the forest, and for a moment, everything was calm and peaceful. The quiet was interrupted by a low growl from Anna’s stomach. The birds hopped off, flapped their little wings, and they fluttered away. Anna held on tightly to her bamboo snack and waved good by to her kind tiny friends.When they were a safe distance away they waved back. In honor of our 35th wedding anniversary, I gave Carrie a vase of garden flowers. As is our custom, I painted an image of it and printed it on a card for her. Inside the card was this poem. 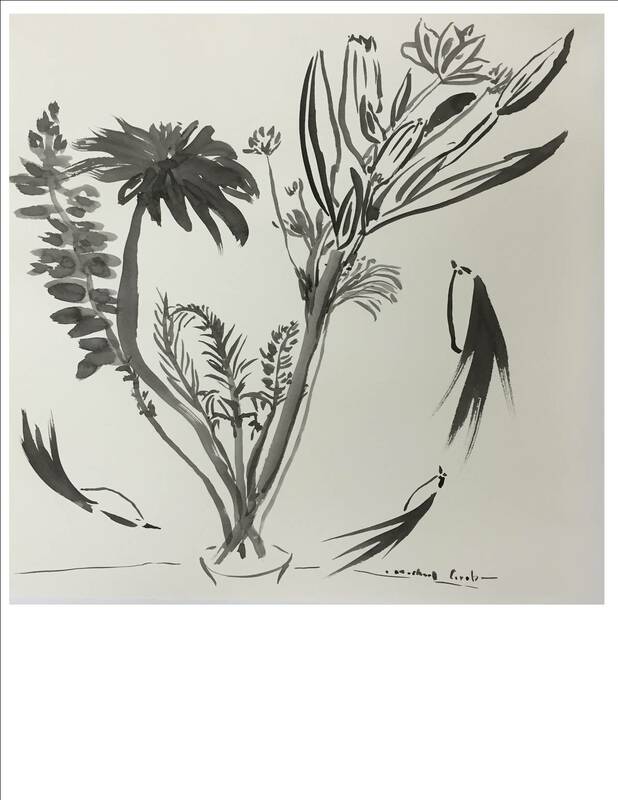 The Cala Lily was the first to notice it. There was something unusual about shape of the swallows. surrounded them like a fresh scent. The Rose knew what it was: Love. and wished that they were birds. imagined that the flowers were looking at them. 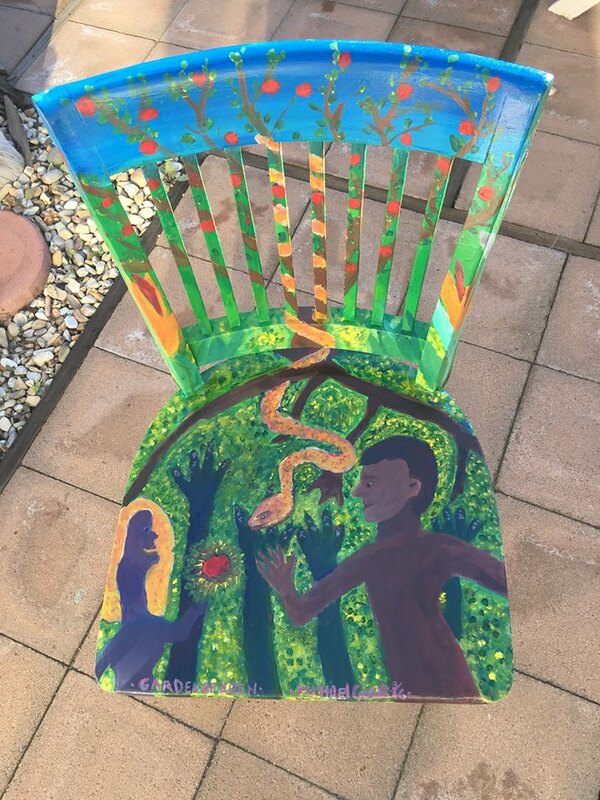 I painted a chair for a fundraiser for the Friends of the Santa Maria library. Participants were asked to paint an image from a book or a story. My favorite story is the Garden of Eden section of the bible. In 2000 I wrote the first version of how I imagine that the story could have been. In the next few weeks I will post images and stories about Adam and Eve and other trees in and around the garden. God realized that taking care of the planet and all of his creations would be a big job, so he made a special animal to help him. God spent a long time giving the new animal all the features and qualities that it would need, including a compassionate heart and a strong mind. He named him Adam, which means “first helper”. God was happy with his newest creation and he cheered. God created Eve to be Adam’s partner. God was content with his creations and he rested comfortably. He saw that Adam and Eve worked hard, and he thought that they deserved a nice place to rest too, so he made the Garden of Eden for them. God was happy, and he cheered. God placed all of his nicest creations in the garden: lush trees for shade and food, brightly colored flowers for decoration, a cool river to drink from and to play in, and singing birds and dancing fish for entertainment. Adam and Eve loved their new play land, and they sang songs of praise and thanks to God daily. The couple spent nearly all of their time dancing and playing in the garden, and God worried that they would neglect the work that he had planned for them. He wondered if making the garden was such a good idea after all. He loved his children, but he knew that they needed to leave the garden if they were going to help him. He came up with a plan to get his children to leave the garden without punishing them, and he asked Serpent for assistance. Serpent was reluctant to do anything for anyone, but when God told him that it would mean that there would be more fruit for him with the Adam and Eve out of the garden, he agreed. God told Adam and Eve that they could eat from any tree except for the one in the center of the garden, and if they ate the fruit on that tree that they would have to leave the garden. They knew that eating the fruit was wrong, but seeing the beautiful red apples was tempting. They saw Serpent pick one and take a bite without God punishing it, so when the snake offered an apple to them, their resistance was easily broken. When God saw that Adam and Even had eaten the apple, he told them that they would have to leave the garden. Before they left, God gave his children a handful of fruit tree seeds. He lovingly explained to them that life outside the garden would be hard at first, but that he would be everywhere to guide them. He instructed them to plant the seeds wherever they went, tend to the trees that grew, and be kind to every living thing. He promised that if he did this that they would have all the riches of the garden wherever they went. God reminded them that that no matter where they were or what they did that he would always love them and be with them. Adam and Eve waved good by to God and to the animals in the garden. They followed God’s advice, planting trees where ever they went, and being kind to living things. They spoke to God often, and soon were blessed with many children. As promised, the trees grew great crops…. and God Cheered. Since we were married in 1981, every year Carrie and I have sent a holiday card with an image of my art to family and close friends. Since our children were small, every year we sent a holiday letter sharing the changes, passions and highlights of each member. 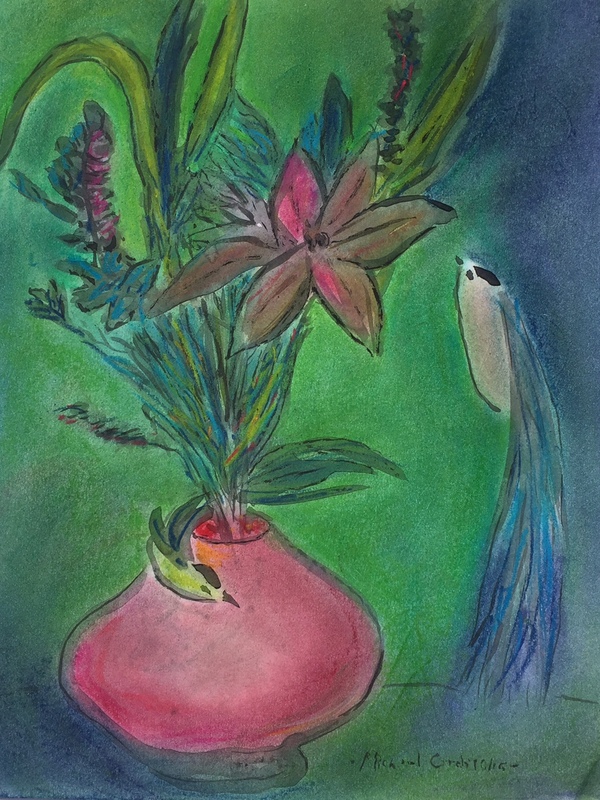 This year we decided to share our ideas in a poem matched to my image, which is an ink and pastel painting. We hoped that readers could see us, and see themselves. Several people have told us that the words touched something in them, or that they cried when they read the poem. That makes us happy. Time will tell if we go back to writing letters. flying gentle circles through yearly celebrations and milestones, peaceful in the lush greenery in our community. 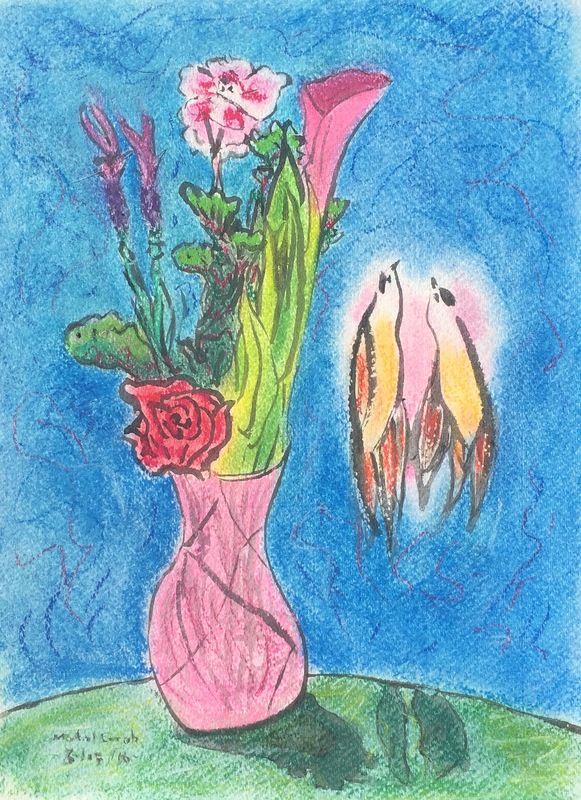 We are the blue bird, happy to watch our pair of feline flowers open, then retreat to nap on our laps, then open again.We are the vase, glowing with pride for our two wonderful independent daughters, passionately finding their place in the world. We are the leaves, working hard, doing our jobs, turning sunlight into energy to help flowers grow. We are the flowers, blooming gracefully, aware of God’s beauty unfolding naturally through us. We are the artist, responding with joy to the beauty around us through song, words and art. We are the pastel colors, gently blending the cooler hues of middle age into a happy inner glow. We are the painting, balancing all aspects our lives in harmony as well as we can. We are the giver of gifts, finding satisfaction in knowing we have helped others to be happy. We are the dreamers, hoping that you too find peace, joy and love in your life through the holidays and in the coming year. I made this ink painting yesterday as a demonstration for the grand opening of the Valley Art Gallery, Even before I finished it, someone asked me if they could purchase it from me. Of course I said yes. It was a great day for the gallery: at least 70 visitors. and most of them were in the gallery for the first time, We hope they come back again with friends! I posted the image and comment on Facebook last night, and within hours, I had 13 likes and 2 comment. This made me feel good, and inspired me to write this poem. “Follow me for a lesson.” commanded the mother swallow. Her children were happy to comply. lead to fun adventures and new ideas. Mother swooped down and around a potted plant. “Try to find the best angle to see beauty.” she suggested. careful to fly where she flew and to look where she looked. Her older child followed his mother’s path, but flew upside down. “The world looks amazing this way,” he said. “You are both right,” Mother explained. Her sons flew 360 degrees again, turning, smiling, and laughing. seeing beauty is a state of mind, not a treasure to find. 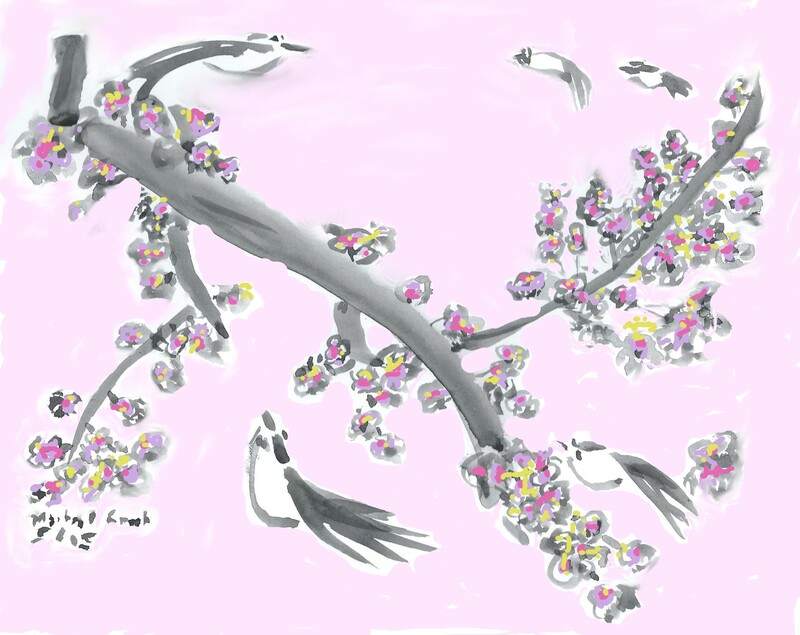 I recently painted an image of large and small swallows flying around a plum branch full of blossoms. 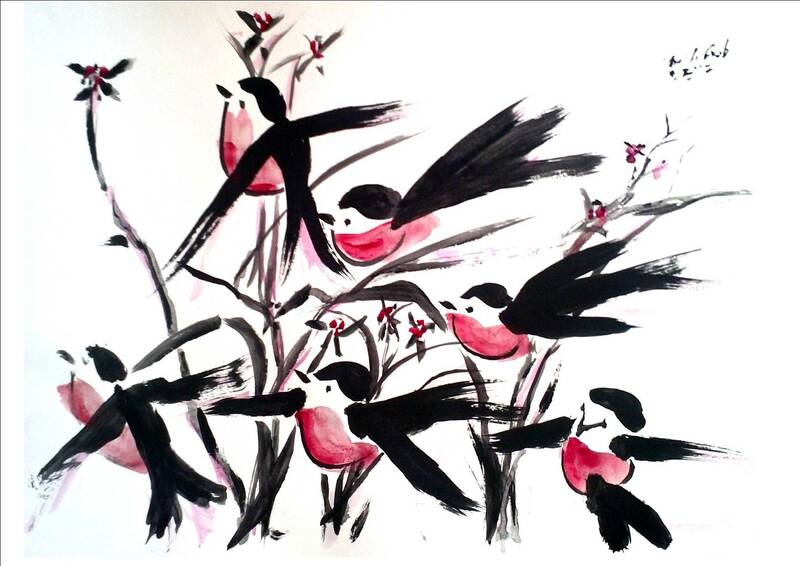 I studied how to paint both the swallows and the blossoms in a book on Chinese Ink Painting. I usually create part of the image from life, but in this case, both parts were from a lesson. The colors also were borrowed, from a paint program on my computer. 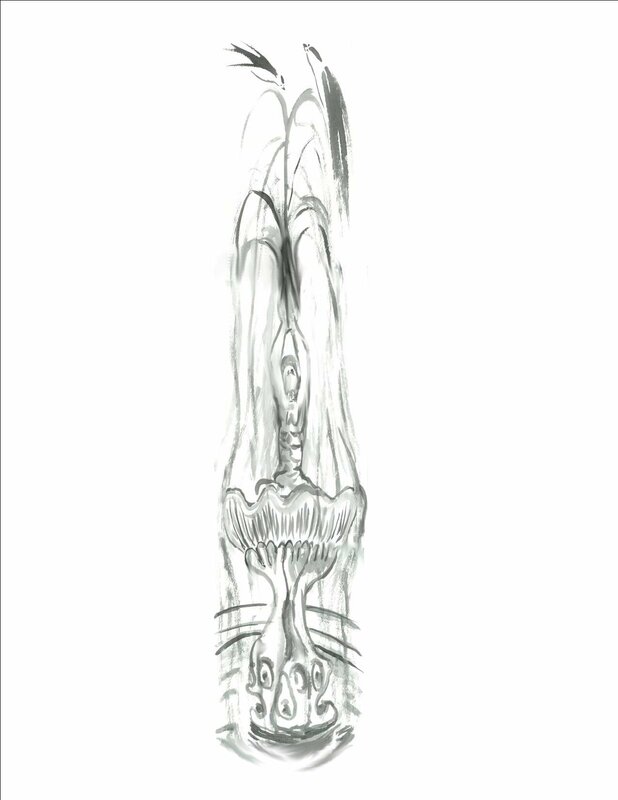 Nevertheless, after completing the image I was inspired to write a poem about it. The lesson about setting your own ego or desire to be in full color aside to support someone else is one that I have been learning recently. said Young Swallow to his mother. why do my colors fade? you become white and something special happens. Mother Swallow smiled and nodded, proud that her son was becoming so kind and wise. and are disturbed by a horrible something! A strong force pushes us upward. Instinctively we flip our fins above us for protection. Now we are completely out of the water, how terrifying! We are human, curled up in a ball in a shell. We feel the solid bottom of the shell, and pull ourselves up to stand tall. We see a golden fruit above us, and we reach for it. we find that we must hold it up. It is heavy, and water cascades on our face and shoulders blurs our vision. comes out of the top of the fruit. the same one that disturbed our sleep. model beings inspiring others by our graceful flight. Last Sunday after church I sat down with a older man, strong in mind, but with ailing health. He told me that it was his 85th birthday. I pulled out from my bag a picture of my valentine painting flowers. I wrote him a happy birthday card with the message, “You are not 85 years old, you are 85 years strong, and your strength is an inspiration to Carrie and I every time we see you.” His smile showed me how much he appreciated me taking the opportunity. 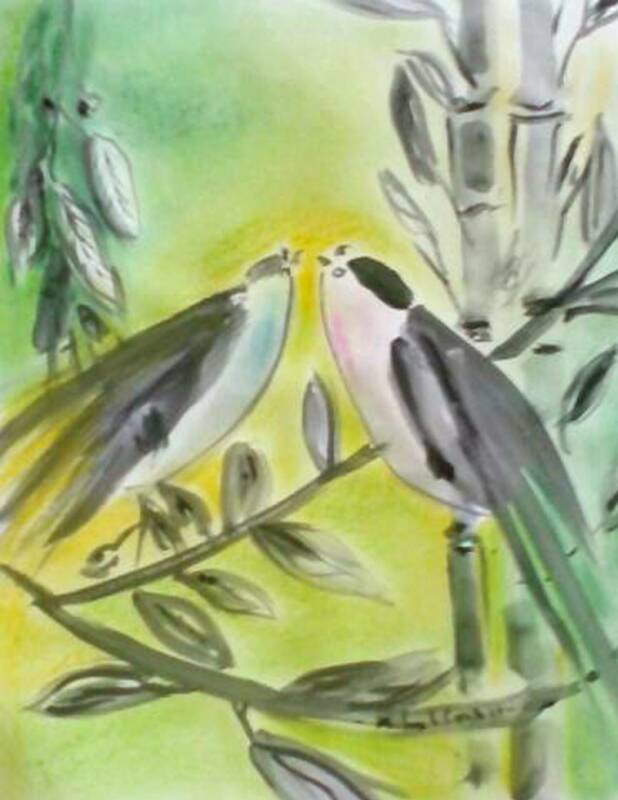 It reminded me of a quote I saw at my Chiropractor’s office, “Learn to listen, sometimes opportunity knocks softly.” I remembered a painting that I made a few months ago of two birds playing horns, and this story came to me all at once. The son blew softly into long thin horn on the branch in front of him. He did not hear a song, so he blew harder, and still hearing no sound, he blew a third time. The father could see that his son was getting frustrated, and that his window of opportunity for learning was slowly closing. “Listen when I blow, ” instructed the father, as he blew lightly into the golden trumpet before him. “Watch the leaves move, and listen for any changes around me as I blow,” the father said softly. When the father blew his horn a second time, the son could see leaves sway, petals of a flower turn slightly in their direction, and a butterfly open his wings and gently take off. The son smiled, blew into his horn again, then opened his wings to find new opportunities. My wife and I recently lead a session of Karaoke at our church. We have been singing “I Got You Babe” by Sonny and Cher for over 30 years, so of course we sang it there. I was looking through my images to finish, and I came across this one. Today I added the pastel background. It seems that there is something special right between the two birds. This lead me to start to write about a conversation between the birds, and well, you can see where it ended up. In case you are not familiar with the Carpenters, a brother and sister team from the 1970’s, one of their biggest hits was “Close to You”. The red bird did in fact feel the same way, but was guarded in allowing the blue bird to come too close. “I’m not sure,” she said, although her heart was beating quickly and her eyes were becoming glazed. “Tell you what,” she whispered, “Come a little closer and I will see if I get the feeling” She wanted to be in control, and be able to pull herself away if she needed too. The blue bird came forward a few inches, and flapped his wings to keep himself fluttering in the air. ‘Wwwwwhell, what do you think?” he asked. The red bird could hardly keep her claws on the branch beneath her. She felt a strong magnet pulling her body toward the blue bird. “Oh, okay you can come a little closer.” She responded, “Let’s not kiss just yet.” she added. Oh my goodness, she thought, why did I say that? The blue bird’s heart pounded and his whole body shook. 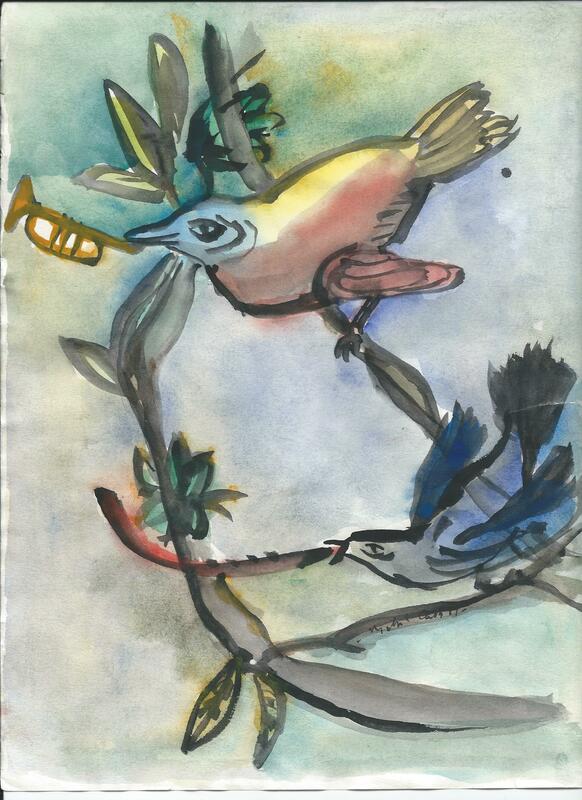 He began to sing notes he had never thought of, and he moved to within an inch of the red bird’s dark black beak. She too sang fluttering notes. Their notes blended together in the small space between their beaks, and a soft glow filled the room outside their cage. ” It’s funny how the love birds can understand the words to this song and sing along,” said the young man. “Maybe they can feel our love as we sing, and want to join us.” said the young woman as she picked up the song sheet to choose another karaoke song for them to sing together. Hurry, we need to get there before everyone else! If we wait too long, it will all be gone! We need to follow the leader! He knows where he is going! We need to fly as high as we can! Birds are meant to touch the sky! Is “Not so fast” all you can say? I can say take things slow. Consider the best course. Follow your own heart. or as far as you have dreamed. This is one of the story paintings that I will include in my upcoming book, Story Paintings Joining Hearts. I am in the process of selecting 18 sets of stories and paintings from over 60 that I have created since 2007, when I published my last set. The following is my first draft of the introduction to the book. Your comments, either in comments section, or via e-mail at youani@aol.com, are appreciated. As the story continues, the young bird realizes and expresses that there is plenty for everyone, that he can set his own course, and that he can reach as high or as low as he desires. The caring grandfather reading the story- painting with his granddaughter discusses the bird’s challenges. The child imagines what it would be like to be the bird, and shares how she would be afraid of the other birds. The grandfather remembers a time when he resisted following the leader, then tells the story and what he learned from the experience. The activity becomes a happy conversation, and two hearts are joined. When the 20 minute experience is over, both the child and the grandparent will have gained new insight, and will leave with a more positive outlook. This is the power of a story and a kind storyteller. This book is a full of stories, images and suggestions for enthusiastic, but not so confident older story tellers to use to help young people with challenges to appreciate nature, to develop self-esteem and to gain confidence in creative expression. Welcome to Story Paintings Joining Hearts. I am sure that you will enjoy the adventure.